In Japan, cell phones have become ubiquitous art of the Japanese culture. 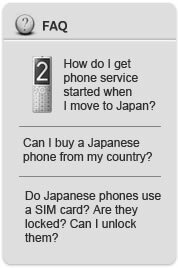 In Japanese, cell phones are called keitai denwa (携�‰��), literally "portable telephones," and are often known simply as keitai. You will be bombarded with opportunities to purchase cell phones, and you will soon notice that almost everyone has one. At the Shibuya train station in downtown Tokyo, 80 percent of the people carry cell phones. Do you need one? Well, you'll have to decide that for yourself. The problem is that all the marketing materials are written in Japanese, and in such a way that most Japanese people have a hard time understanding them. The most expensive service is DoCoMo (NTT). It's also the most popular. (Note: Japanese are not deal hunters, and service providers know this.) From my own research, which was limited, I think that the cheapest cell phone (especially if you are a student) is Au (a.k.a., KDDI). Don't even think about getting "unlimited weekend minutes" or "250 anytime minutes." You may find that you can only afford 30 minutes a month. On the other hand, with a little practice you'll be sending emails with your cell phone rather than making phone calls. Sending emails to other cell phones is much cheaper than calling, and it's very popular. In fact, you'll see young people everywhere you go checking and typing email.